Welcome to RolexMagazine.com...Home of Jake's Rolex World Magazine..Optimized for iPad and iPhone: 1947 Rolex Oyster Perpetual Ad SuperCase Design Origin? 1947 Rolex Oyster Perpetual Ad SuperCase Design Origin? 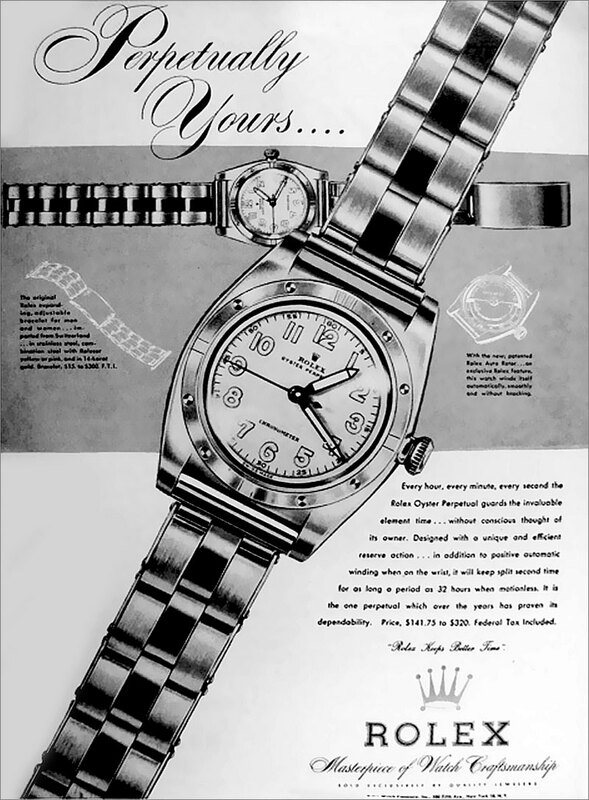 The 1947 Rolex Oyster Ad below is from 1947, and I could not help but notice the shape and width of the lugs is remarkably similar the all the new SuperCases on modern Rolex sports watches. In other words, if you compare a prior generation GMT or Submariner case to the current versions, the current versions are referred to as "SuperCase" because Rolex seriously fattened up the lugs. In other words, the case is squarer, which contrasts more with the round bezel and dial shape, as apposed to a less square case that follows the roundness of the dial and bezel shape. I can't help but wonder if this unusual design language came from or was inspired like so many things Rolex does, from their past? Also notice the very early Rolex Oyster bracelet is not tapered. I wonder if Rolex will ever go back to a straight Oyster bracelet?